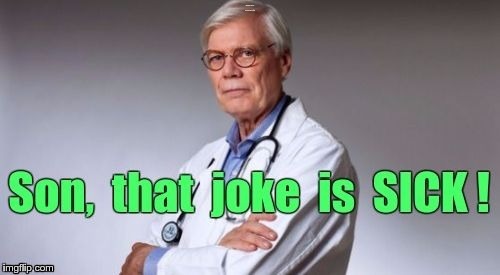 ADD THIS AT MEME BOTTOM WITH ADD IMAGE: Doctor says joke is SICK. I put this in user templates. It's intended to be added to an existing template with Add Image - Below Image. The template name is "doctor says sick joke". I deliberately did not name it "joke is sick" because most folks wouldn't include "is" when searching. This is cut off from a larger meme. Unfortunately, I can't find the original "annoyed doctor" image, and this also already has in imgflip.com watermark. Add-image TEMPLATE: Doctor says joke is SICK!